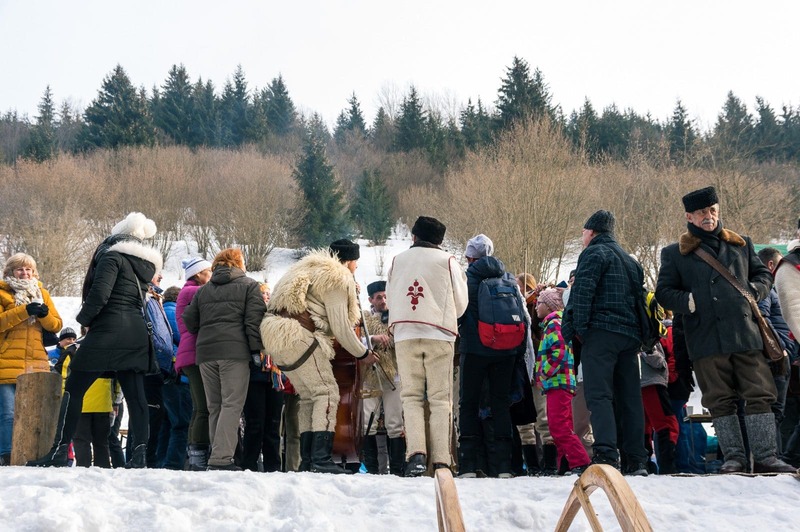 Every year between January and March, at the south foot of Low Tatras in Slovakia, a thrilling championship takes place. 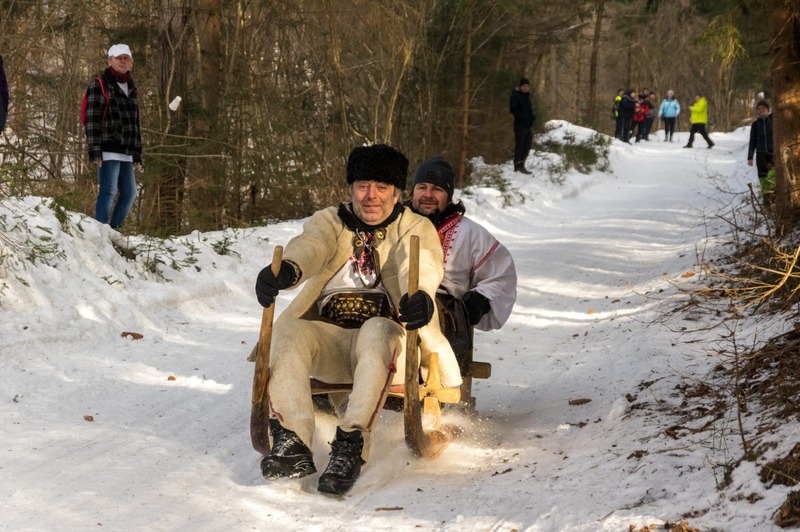 It’s the annual races of Krnohy—the traditional Slovak wooden sledges. These heavy sledges are stirred by two unstrapped daredevils who race down a steep snow road—usually through the woods, while stirring it with their feet and by moving their weight left and right. To make it even more spectacular, some of the crews are dressed in traditional Slovakian folk clothing. I was fortunate to watch the first race of the year that took place just outside of the village Valaska, on Potocky hill (info and calendar here). People started to gather from the morning alongside the downhill route and the finishing line where several kiosks with traditional food and plenty of alcohol were set. Today, there were more than 50 crews waiting to start their run from the top of the slope. The route would take them through some pretty fast turns on a narrow forest road that comes down Potocky and their maximum speed would be close to a hundred kilometers an hour at some points. By the time I left Valaska, I was already a bit late and by the time I got to the finishing line, the race was already on, and the first sledges were charging down the small snow-covered road. These handcrafted sleds are made of solid wood from rugged trees that grow on the rocky terrain around these majestic mountains. The simple wooden frame sits on two thick skids. Two transverse planks serve as seats and four handles on the sides, are used for the crew to hold on for dear life as this contraption storms down the narrow route sometimes centimeters away from tree trunks and hard snow banks. The front tips of the skids are bent upwards and are pointy like a horn, giving krohnys a rather sinister look. I found a good spot on the side of the road and started taking shots as the contestants flew by, gathering speed on the final straight before the finishing line. It wasn’t long after, when a sled failed to negotiate the last turn and hit the snowbank with a big thud, flipping on the side and sending the crew on the snow. Fortunately no one was hurt and they were back on their krnohy in no time. It was chilling cold and the sleds were coming down every couple of minutes. Temperature hadn’t been above 0 degrees Celsius for more than a week. Ιn the meantime the spectators who were gathered by the finish line, were warming up with slivovica (drink from plum distillation), hot tea and delicious goulash. They were singing along with the small folk band that played traditional music and seemed to be having an absolute blast! The big party was joined by the krohny crews and everybody was singing and drinking merrily around small fires having a great time. Their mood was really contagious. Of course I joined in. Some people next to me offered me Slivka from their bottle and I gladly had a sip of the 50% alcohol dynamite. It was so cold that I could feel the liquid going down my throat and stomach. One of the things I love about Slovaks is that they know how to have a good time and that even when they have a few drinks more, they always remain jolly and peaceful. The party went on for quite some time before the crowd started to break up. After it was over, a few brave souls walked down the village’s pub to keep the party on till sunset. All in all it was a great day. It’s this kind of experience that really introduces foreigners like me to the local culture and traditions. 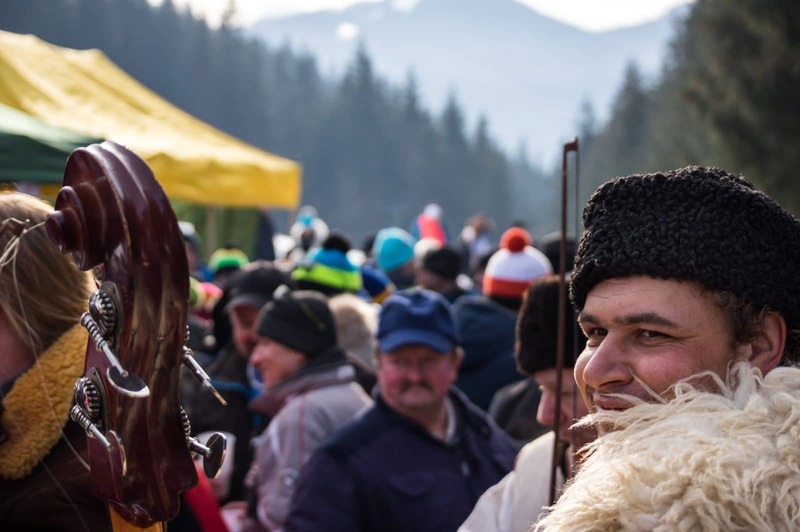 Krnohy races are a great local event and shouldn’t be missed by winter travelers. I left the race with a smile on my face and it wasn’t only the slivka. How fun! I’d love to see a Krnohy. Do they open up the trails later for the spectators to slide down? Such a neat cultural experience! I would love to bundle up and join in the fun! this looks like such a fun cultural experience, that video is priceless!! I never had the chance to do this when i was there and this makes me want to go back! It was a fantastic experience to all the joiners! Amazing and I love the video as well. Wow, the traditional Slovak wooden sledges in Slovakia really look cool. Living in a tropical country having been playing with that beautiful snow is somehow a dream. Anyway, I would love to witness this kind of sledges in the near future If I get the chance. Sounds like fun! heh. I know what people of Finalnd would ask: Why they are without helmets? 🙂 Everyone in Finland is obsessed with safety.